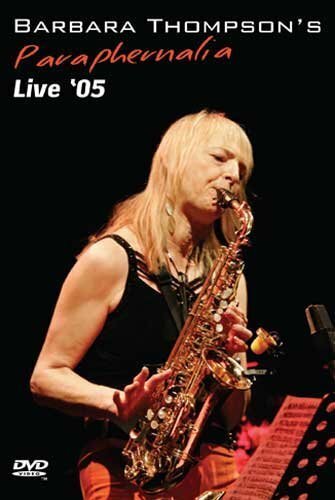 Barbara Thompson – soprano, alto, tenor saxes and recorder; Peter Lemer- keyboards; Billy Thompson-violin; Dave Ball – bass guitar; John Hiseman – drums with brass and sax sections on two tracks. In spite of inauspicious circumstances, among them inadequate time allowed for a sound check and a worsening of Barbara Thompson’s medical condition, this DVD captures her and Paraphernalia in excellent form in a session taken from their `Never Say Goodbye` tour in 2005. Some of this footage was used in a subsequent BBC documentary, `Playing Against Time` which tells of her on-going struggle with Parkinson’s disease but here we have two full sets of music plus encores expertly photographed with imaginative camera angles providing the viewer with a `best seat in the house` concert experience. The playlist is made up entirely of Barbara Thompson’s compositions with one exception, an idiosyncratic version of Benny Golson’s hard-bop classic `Are You Real`, and are executed with all the energy and precision demanded by her highly mobile brand of jazz rock with its world and folk music allusions. The pace never falters, driven along by Hiseman’s magisterial presence on drums and Dave Ball’s plangent bass lines, and even when it slows to take in a blues like `Smokey Embrace` it still smoulders with menace. Add to this volatile sound stage the highly variegated colourations and multi-phonic cries of Billy Thompson’s violin underpinned by the space-age harmonies of Lemer’s keyboards and you have a musical concoction of considerable potency that commands your unwavering attention from start to finish. Plenty of solo space is provided for each of the instrumentalists and each prove more than equal to the task of matching Ms Thompson’s inventiveness on her various instruments. Additional variety is provided in the form of an overdubbed brass section which appears on two of the numbers in split screen format as do some of the ensemble sections for the core band. It must take considerable stamina to perform music of this type given the duration of the pieces not to mention a quick and penetrating intelligence in maintaining the interplay of musical ideas between the various instruments whilst negotiating the twists and turns of her convoluted themes and to be able to carry this off whilst suffering the effects of a debilitating illness speaks highly of Barbara’s determination and courage. No-one without prior knowledge of her condition would be able to detect any of this from the performance shown here. Happily, we learn that new medication is stabilising Barbara’s condition and she is making a tentative return to performance appearances; she has however continued to work on her compositions and one of these which can be heard on her website www.templemusic.com will interest those who are following the career of Jess Gillam, finalist of the BBC Young Musician of the Year 2016. `The Sky’s the Limit` is an elegiac saxophone concerto and on the site you can view a clip of Jess performing this amid beautiful Lake District landscapes and the environs of her home town of Ulverston. Like the DVD at hand, it’s well worth a look.